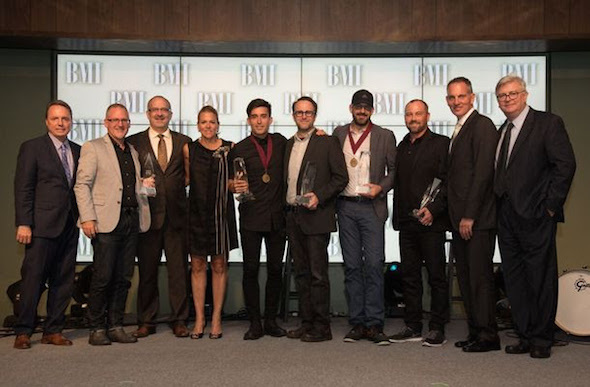 Chris Stevens was one of the big winners last night (June 23) at BMI’s 2015 Christian Awards, taking home Songwriter of the Year honors. The annual awards ceremony at the PRO’s Nashville offices recognized the past year’s most-performed Christian rock, contemporary, inspirational, southern and urban gospel songs played on Christian radio. “This is Amazing Grace” received the Song of the Year award. Penned by Phil Wickham, Josh Farro, and Jeremy Riddle, and published by Phil Wickham Music, Seems Like Music, and Sing My Songs, the track topped the Billboard Christian Airplay chart and was performed by Wickham during the evening’s festivities. Williams and BMI Director, Writer/Publisher Relations Leslie Roberts served as the evening’s hosts. A complete list of the 2015 BMI Christian Awards is available at www.bmi.com/christian.